As the title of this post suggests, yes, I went to see the male Redstart by the Nene Valley Railway this evening. And no, I didn't see it. 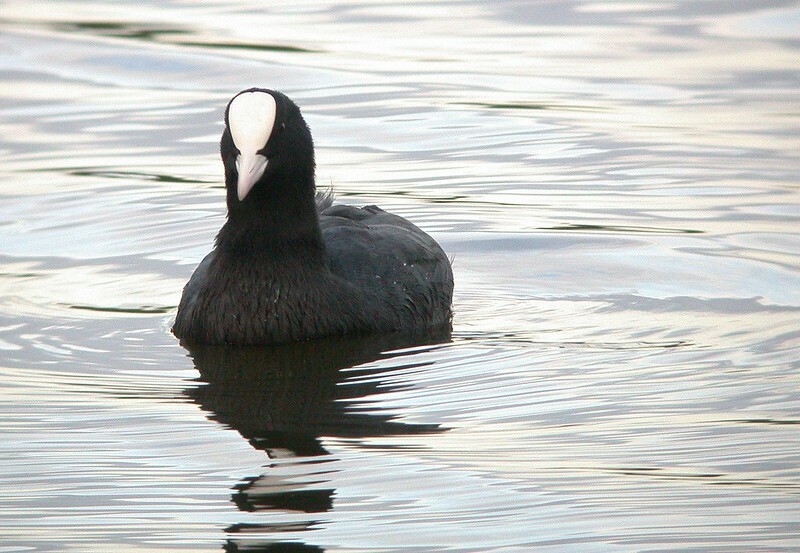 A "very showy" bird earlier today has changed into a "not-showing-at-all" one. Never mind. Click here to see Brian's photo of it. I'm really happy with the Green Woodpecker photos above, though. A mixture of luck and skill (or so I'd like to think!) allowed me to get these shots in the beautiful evening light. The lucky part was a cyclist flushing the bird up from the side of the railway line, and it perching in a tree a little way in front of me, with the sun behind me. The only skill involved on my part was: a) managing not to make my tripod legs squeak as I set up; b) moving slowly and quietly; c) plonking camera onto scope and pressing appropriate buttons when required. That's what's so great about digital cameras and digiscoping - even people who know nothing about photography (like me) can get surprisingly good results! There has been a string of Redstart records from Ferry Meadows over recent days/weeks. This is a pretty rare species in the PBC area, since (like Pied Flycatcher), it has a westerly breeding distribution in Britain, so we rely on passage migrants being found. Very often, they don't hang around, so these birds represented my best chance yet to get them on my list. Being a Bank Holiday, FM was busy with barbecues, kite-flying and football, even though the weather was less than ideal, being showery and very windy. I lurked for about 90 minutes in the required spot before I glimpsed a shape flying into the dark depths of a hawthorn bush. I thought 'well, either that was a Robin or a Redstart', and before I could pick my bins up, I saw the bird's tail quivering... Yes! I spent the next 30 minutes or so watching, but mostly waiting. It was incredibly uncooperative! For about a total of 60 seconds it fed on elderberries out on the side of the hedge, but the rest of the time it was out of view, and there were certainly no digiscoping opportunities. That didn't matter; it was just nice to have picked it up at all. Mike Weedon would like to point out that he got some photos of the other (first-winter male) Redstart that I didn't see. Click here to see 'em. An ongoing gallery of autumnal goodies. Went to look for the Redstarts on Coney/Oak Meadow. Unsuccessful on that count, but I found two Spotted Flycatchers (one adult, one juvenile). Not much else of note around, but I did some digiscoping. I was trying for the oxpecker feeding around the hooves of giraffe/elephant/zebra/wildebeest effect, but this is as close as I'll get. ¡Los saludos a nuestros visitantes españoles! Attempted to find some migrants this morning. Matt Webb keeps turning up the stuff at Ferry Meadows, so Brian and I tried to give the surrounding area some coverage. He did the Coney Meadow area, while I tried my luck at Mill Lane, Castor (just west of Ferry Meadows in the Nene valley). Matt Webb saw a Redstart this morning close to the gap in the hedges connecting Coney and Oak Meadows. Due to not having been around most of last weekend, I have realised I failed to report a message from Matt Webb that last Saturday morning. In the same vicinity of Oak Meadow he saw a Whinchat, Wheatear plus saw and heard a Tree Pipit. What cheeky little chaps they are. Digiscoped through double-glazing. TV presenter Nick Baker presents the Young Birders of the Year with their splendid prizes. L-R: Caroline Simpson, Claire Maloney, Nick Baker, Becky Searle. One of the most inspiring events is always the presentation of the Young Birder of the Year prizes. Being a birdwatcher at a young age can be really hard work. You can't drive yourself around, your mates take the mick out of you and perhaps you can't afford good binoculars or a telescope. Artists at the Birdfair created a Peruvian-themed mural, Peru being this year's project which will benefit from the money raised. Note Clive Byers' painted toenails. MJW takes on the mighty Brazil. The highest highlight of the Birdfair each year is the charity football tournament which takes place in one of the car-parks [fields] on Saturday evening. As usual, Mike Weedon played on the mighty Windrush Harriers team and I was present on this auspicious occasion to record it for posterity. The squad, comprising Mike Weedon, Dominic Couzens, Dave Gray, Rob Still, Rob Fray and Ian Lewington, 'managed' [shouted at] by Ralph Todd and 'sponsored' [T-shirted] by David Tipling (the Roman Abramovich of the birdwatching world) was sadly knocked out at the first opportunity, having had two no-score draws, a win and a defeat. What a shame. The Rutland Sparrows (who drew with Windrush in the first round) played the Wildfowl and Wetlands Trust in the final - WWT came out on top and won the splendid trophy. The real highlight was after the match when Tyto the dog stole one of Mike's boots. Foolish animal. Happy punters on the Bird Watching magazine stand. This badger probably should have played in the charity football match but went home instead. "UK birdlovers are delighted that an attempt to re-establish the corncrake in England appears to be going well. A group of month-old corncrake chicks has been spotted on the reserve where they are being released in England. " Click here to watch a news clip [RAM] featuring the RSPB's Charlie Kitchin! Click here to read about the release I attended last week. Steve Dudley had visited a while before we got there and only seen four Common Sands and one Greenshank. HA! But by far the best birds were three Hobbies which were enjoying the strong winds. Again and again, they just 'hung' there in the air, Kestrel-style, before folding their wings and stooping (Peregrine-style) after the Swifts and House Martins which were feeding lower down around the trees. After stooping, the Hobbies disappeared out of our view and then reappeared, as if by magic, in a totally different place! Truly spectacular stuff. The two above photos taken by Weedon's World of Nature (as he now likes to be called). That's me with the dragonfly on my hat. I love the sunlight shining through these leaves. Went to Ferry Meadows in the hope of finding a Redstart, Whinchat or Pied Flycatcher but discovered very little indeed. The only bird of [very slight] interest was a Grey Wagtail that flew over. 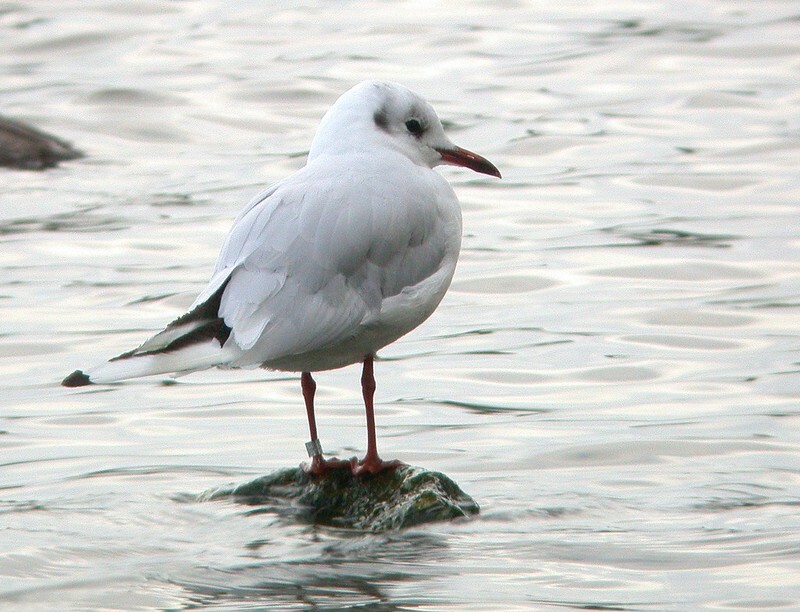 Black-headed Gull with metal ring on left leg. Most British ringers put rings on the right leg.